The Ayurvedic texts list Long Pepper as one of the most powerful Rasayana herbs, meaning it is a longevity enhancer. Long Pepper is one of the most widely used Ayurvedic herbs. Primarily used for cold, wet and ‘mucusy' conditions of the lungs. Pippali encourages vasodilation and therefore increases circulation, specifically to the lungs. Used with honey in asthma, bronchitis, pneumonia and compromised immunity in the respiratory system. Long pepper helps in expelling out the mucus accumulated in the respiratory tract, it strengthens the nervous system, improves the gastrointestinal condition and normalizes the peristaltic movements. The herb serves as a good digestive agent. 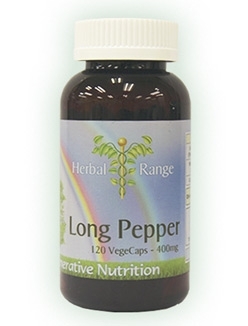 Long pepper helps in suppressing pain and reducing inflammation, tones up the urinary tract. Further benefits include help with anorexia, indigestion, flatulence, abdominal pain, hyperacidity, piles, paralysis of the tongue, diarrhea, cholera, chronic malaria, viral hepatitis, diseases of the spleen and tumors. It is useful as a sedative in insomnia and epilepsy and is also used as an aphrodisiac, since it boosts the reproductive system. Long Pepper (Piper longum, AKA Pippali), sometimes called Indian Long Pepper, is a flowering vine in the family Piperaceae, cultivated for its fruit, which is usually dried and used as a spice and seasoning. Long pepper has a similar, but hotter, taste to its close relative Piper nigrum - from which black, green and white pepper are obtained. The word pepper itself is derived from the Tamil/Malayalam word for long pepper, pippali. Today, long pepper is an extremely rare ingredient in European cuisines, but it can still be found in Indian vegetable pickles, some North African spice mixtures, and in Indonesian and Malaysian cooking. Pippali is one of the most widely used Ayurvedic herbs. The botanical name is Piper longum and it belongs to the family Piperaceae. In english it is called Long Pepper, in Hindi Pippali. It is primarily made up of volatile oil, resin, piperine, piperlongumine, pipperin, Pippalartin, Piplartine. The fruit of this Long Pepper plant is commonly known as Pippali and its root is called as Pippali Mool. In addition to being something that helps people's stress and sleep conditions, Piper Longum reconciles digestive functions and relieves problems related to, dyspepsia, anorexia, abdominal pain, flatulence, acidity etc. It is also useful as a brain tonic. Piperine is a substance found in the plant Piper Longun. Black pepper Oleoresin or Long pepper Oleoresin is used as the source of Piperine. Piper longum is widely used in Ayurvedic and Unani Systems of Medicine particularly for diseases of the respiratory systems like bronchitis and ashtama and for stress relief, sleep disruptions etc. Piperine increases thermogenesis. It also improves the bioavailability of the nutritive substances such as beta carotene, curcumin selenium, pyroxidine (B6), glucose and amino acids. Piperine relieves inflammation, pain and asthma; improves digestion and improves production of Serotonin a phenolic amine neurotransmitter. It is a powerful vasoconstrictor and is found esp. in the brain, blood serum and gastric mucous membrane of mammals and to known as also 5-HT. 5 – hydroxytryamine. In Mexico for instance, it is used to treat stomach aches. Scientific research has yielded preliminary evidence which suggests that piperine may aid in the digestion of food. Systemic pharmacological studies on piperine show that this compound elicited diverse pharmacological activities, analgesic, ant-pyretic, anti-inflammatory, anti-convulsant and CNS depressant activities. As per Ayurveda, piper longum is an important Medhya-Rasayana. It also helps to improve memory power. A marked anti-inflammatory activity of piper longum fruit decoction against carrageenin induced rat paw odema was reported by Sharma and Singh, 1980. (Bull Med Ethnobot Res, 2, 262). The plant grows all over India, in evergreen forests and is cultivated in Assam, Tamil Nadu and Andhra Pradesh. A small shrub with a large woody root and numerous creeping, jointed stems, thickened at the nodes. The leaves are alternate, spreading, without stipules and blade varying greatly in size. The lowest leaves are 5-7 cm long, whereas, the uppermost 2-3 cm long. The flowers are in solitary spikes. The fruits, berries, in fleshy spikes 2.5-3.5 cm long and 5 mm thick, oblong, blunt and blackish green in color. The mature spikes collected and dried, form the commercial form of pippali and the root radix is known as pippalimula. Pippali is seldom used externally except in the case of painful and swollen conditions, wherein its paste is applied. Though it has mild antiseptic property, it is an irritant to the skin and can manifest in allergic reactions. Internally, pippali is invaluable in vast range of diseases. Pippali is the best herb recommended for disorders of the spleen. It is a powerful stimulant for the digestive and respiratory systems. It is strongly heating and removes cold, congestion and the undigested toxic elements. It revives weakened organic functions. It is also a rejuvenative to lungs. Pippali effectively reconciles the digestive functions and is used with benefit in cases of anorexia, indigestion, flatulence, abdominal pain, hyperacidity, piles etc. It works well with honey to combat hyperacidity. Pippali is beneficial as a brain tonic. One of the herbs mentioned in all ancient scriptures of Ayurveda. In Sanskrit, it possesses various synonyms, describing its properties and specialities, like usana –pungent, capala – quickly acting, krsna – black, magadhi – from Magadha region, upakulya – growing near water resources, kola improving the test sensation etc. The great sage Caraka has categorized it as dipaniya – an appetizer, kanthya – beneficial for the throat, uptighna – anti-saturative, asthapanao-paga – an adjunct to decoction enema, sirovirecaniya – a cleansing nasal therapy, purisa sangrahaniya – give form to the faeces, purisa virajaniya – give color to the stool, sita prasamana – relieve cold sensation on the skin, sulaghna – anti colic, rasayana – a rejuvenator, kasahara-anti-tussive, vamaka- emetic, hikka nigrahana – mitigates hiccup. The root of pippali, pippal mula is cited as dipaniya – an appetizer and sulaghna – anti colic. Pippali is a specially recommended rasayana for respiratory system (Pranavaha srotasa) and is the best rasayana rejuvenative to kapha dosha. CHEMISTRY AND PHARMACOLOGY OF PIPER LONGUM L. This is a fantastic, detailed .pdf file, from the International Journal of Pharmaceutical Sciences Review and Research. Right click on the link and select "save target as.." read offline at your leisure.